Click to download a print copy of these directions. Leave the M40 at junction 9. At the roundabout follow signs for the A34 Oxford. Continue along the A34 (south) for about 6 miles. Leave the A34 at Peartree interchange and follow signs for Oxford and Ring Road (A40). Continue for 4 miles and at the roundabout (Headington roundabout), take the exit marked city centre, Headington Hospitals, onto the A420 (London Road). Proceed through Headington until you see a petrol station on your right hand side. Take the 2nd right after the petrol station on to Sandfield Road. Take the first right on to Beech Road and the hospital is at the end of the road. Leave the M40 at junction 8 and follow signs for the A40/A418 Oxford/Cheltenham. Continue along the A40. At the roundabout (Headington Roundabout) take the exit marked city centre, Headington Hospitals onto the A420 (London Road). Follow directions as above. On exiting the underground car park turn right into Osler Road and then turn left onto A420 (London Road). Oxford also has 5 Park and Ride sites around the ring road. 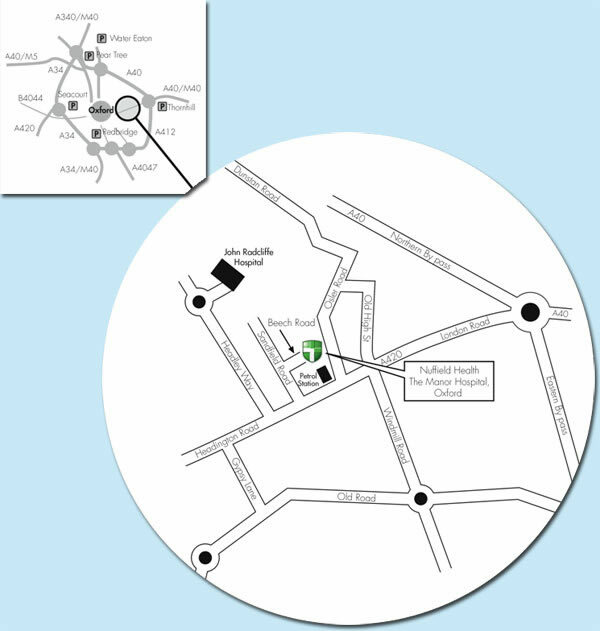 The nearest and most convenient for the hospital is Thornhill, which is easily accessible if coming from the M40 junction 8 and A40 and is clearly signposted. If coming from M40 junction 9, follow the directions above, except when you reach the Headington roundabout, take 2nd exit and follow signs for Thornhill Park and Ride. The Park and Ride service runs at peak times Monday to Saturday and every 30 minutes at other times. The nearest stop to the hospital is on the London Road and there is a footpath (service entrance) from London Road to the hospital alongside the petrol station. At the end of the footpath turn left and follow the footpath around to the front of the building to the entrance. The nearest Station is Oxford Station, which is a main line station with regular service connections to all parts of the UK. The hospital is a approximately 10 minutes away by taxi. There are frequent and reliable bus services from the outskirts of Oxford to the city centre, as well as services from the city centre to Headington. The nearest stop to the hospital is on London Road.